You could argue that a little birdie told him to do it. While out running errands on a hot day, Ion Ionescu of Ionescu Design in New York City came upon an injured baby sparrow that had fallen on the ground at a bus stop. An experienced rescuer who routinely helps injured birds of all kinds (from finches to even a red tail hawk), Ionescu scooped up the little sparrow and brought her to his office, which, in addition to his bench and tools, contains cages of all sizes. Cheerie, as she would soon become known, was severely dehydrated and had a deformed wing. A vet at a wildlife center stated that her parents probably threw her out of the nest because of her malformed wing. Already enamored with the tiny creature, Ionescu set up a cage for Cheerie with a hot water bottle on the bottom. Seeking to make her comfortable, he made a tiny, soft pillow that he laid on top of the warm bottle for her. He then spent many hours observing the little creature and was charmed at how she sank into the softness of her pillow. The image of the soft pillow stayed with Ionescu, and he thought it would be appealing to try and duplicate that softness in hard stone, and then make it into a piece of jewelry. “I always seek simplicity and directness in my designs,” says Ionescu. Finding clear designs of utmost elegance, Ionescu believes that the more evocative and simple a design is, the more enduring it will be. When he initially began drafting his design for a pillow-inspired ring, Ionescu created a few wax models of a pillow. He ultimately selected the one that he felt best translated the idea of softness and had the most pleasing proportions. Using the wax pillow as a guide, he cut a few pillows out of various rough stones. Once he had cut a good grouping of stone pillows, he created waxes for the ring shanks that would surround them, and had them cast in different metals and colors of gold. He then proceeded to choose the colors of the pav? stones that he planned to lie across the tops of the pillows. In the end, he made 12 pillow rings in various color combinations, believing that each colored stone chosen imparted a different flavor to the design: very feminine for pink quartz, romantic for frosted aquamarine, bold for ruby, earthy for chrysoprase, and opinionated for labradorite. Feeling that this collection was extra special, but unable to choose between the pieces, Ionescu submitted four of the rings into the AGTA Spectrum Awards competition. Ultimately, it was the combination of labradorite, Paraiba tourmaline, palladium, and black rhodium that took first place in the competition’s evening wear category. Unlike the other rings in his pillow collection, this particular ring initially posed a challenge due to the natural cleavages in the rough labradorite. Ionescu wound up having to carve four different pillows in the stone before he finally arrived at one he was pleased with and that he felt truly captured the 36-carat gem’s fire. To complement the blue and yellow colors in the stone, Ionescu chose 1.5 carats of neon blue Paraiba tourmalines to set on the part of the shank that nestles into the stone pillow. 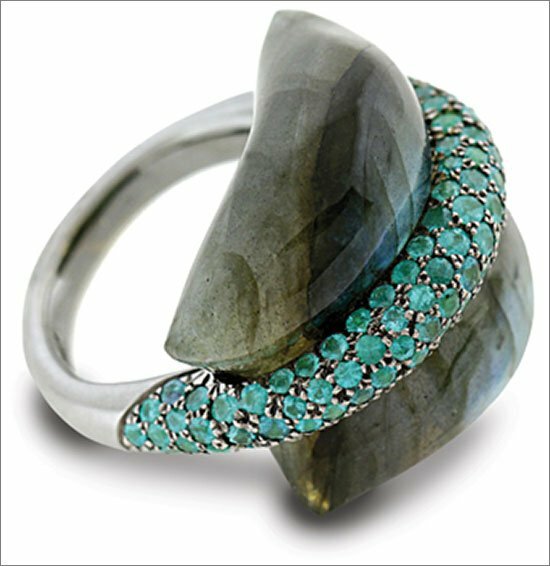 In making the ring, Ionescu drilled holes into the top of the labradorite that matched up with two pegs that he laser welded in place on the shank, relying on them and the tension in the shank to hold the stone in place. Before fitting the shank over the labradorite, he micro-pave set approximately 130 Paraiba tourmalines across the top of the ring. To create more of a color contrast, he plated the prongs holding the tourmalines with black rhodium. After creating the ring collection, Ionescu settled on calling his design “pillow for dreaming” because he believed it served as a reminder that anything is possible for the creative mind and sensibility. Cheerie would have approved. While she was never able to fly, she lived out the rest of her natural life in a comfortable home within Ionescu’s studio. She would often be found snoozing on his shoulder while he worked at the bench. Although she recently passed, her legacy lives on in the pillow for dreaming collection.